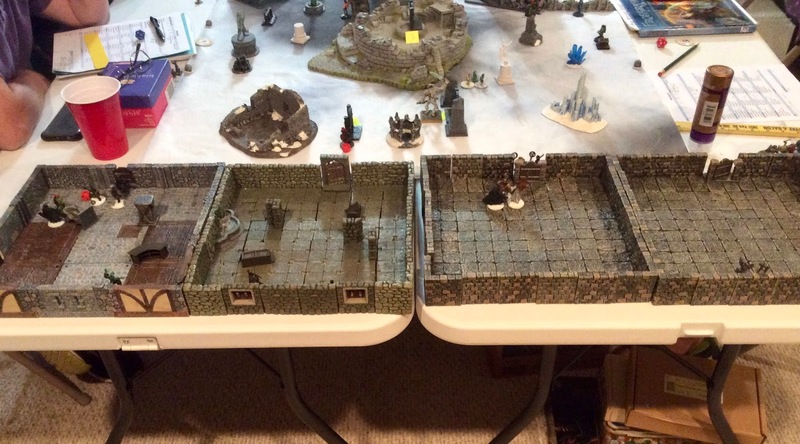 This past Saturday we got together for the 7th game of our 2017 Frostgrave Campaign, just two weeks after our previous session. 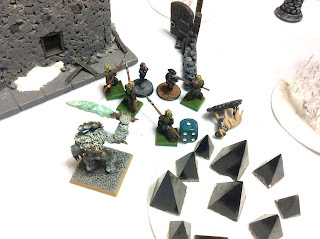 While last time we returned to the Core Rulebook for our scenario, doing The Library; this month we returned to the Thaw of the Lich Lord supplement with the 6th scenario, The House of Longreach. Because we had 8 of our regular players for this session, we had to modify the scenario a bit, renaming it The District of Longreach. So instead of one legendary mansion, we declared it to be Frostgrave's lost Banking District. With magic portals that helped customers move from location to location around the district and the secure treasure vaults located a mile beneath the city. With 8 players, we multiplied all the scenario requirements times 4; so there were 4 vaults and 24 portals. Also, 8 Frost Wraiths (2 in each vault), 4 Zombie Trolls, and 16 Death Cultists. We placed the portals, and then the remaining non-treasure-room treasures, then chose our starting spots. I luckily drew the chance to pick the first selection spot, and Quail, my Sigilist, was able to get a corner entry location. Gru the Soothsayer was on Quails' right, but the lucky location of the ruined viaduct between our two stating zones, meant that she saw no sight of him or his yellow minions; all of whom kept to their side for the length of the game. Diagonally across from the Sigilist's band was the Summoner Challara (The wizard formally know as Chaffron, aka Saffron), and directly across was Missy the Necromancer and her band of warriors from across time and space. An overall view of the table. Quail's entry zone is marked in red in the lower right. Earlier in the morning the Sigilist Quailelyn, the Maga Librarian at her University's Library, and her Apprentice Bailisette, could be found in the main hall of their tower base, preparing for the day. Quail sat at the long dining table watching her Apprentice with quiet concern. The young woman hadn't been the same since her near-fatal injury just a couple weeks before in the ruined underground library they had explored during that expedition. (See last months write-up.) Bailey still carried the two long scars on her face from the Grenade spell, though they were much less angry than they once were. But she also still had emotional scars inside, that were doing less well. Quail knew her Apprentice hadn't been sleeping much the past weeks, and was spending every minute busy in some task or another. She ignored the rest of the group, and kept to her room for long periods. 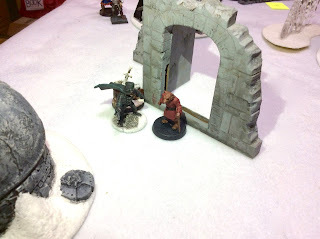 The Sigilist wizard felt helpless as all attempts to offer help had been rebuffed. She desperately hoped that time would heal her Apprentice's inner wounds. Quail sat at the table before the kettle, and as she watched her Apprentice with great concern, she attempted to finish her potion. "Thank you, Bailey!" she said encouragingly. "You've done wonderfully." The Sigilist could see the large dark circles under her Apprentice's eyes, and the white scars on her face still had a sheen on them that reflected the firelight. Unfortunately, Quail's attention was too focused on her Apprentice, and the Maga Librarian accidentally added twice the amount of the last ingredient as she concluded the incantation. The potion foamed up and turned black. (Quail fails to cast Brew Potion). The wizard was horrified, and began to apologize to her Apprentice over and over. Bailey simple dismissed the apologies as unnecessary, and with a somber demeanor, came over and grabbed the pot's handle with a thick rag and carried it to the nearest window to dump it. Now, as they entered the outskirts of the city, Bailey tapped Quail on the shoulder and silently pointed to a statue of two battling figures that was just a little further in the distance. "Scrolls, there." she said simply. The Sigilist took the opportunity to halt the group and divide everyone up into their respective commands. With herself she took Sir Cardidil the Knight, Luc Demic the Marksman, and Clol the Barbarian. To her Apprentice she assigned Kinny the Treasure Hunter, Sallisee the Ranger, and Barc the Man at Arms. Innis Flynn and Dorchesman the two other Treasure Hunters, and Crivid the Warhound, were instructed to help where needed. Quail outlined a quick plan; she and her group would search to the right, and Bailey would take hers and move to the left. As everyone began to head off, the Maga Librarian grabbed Barc by the forearm and whispered into his ear, "Watch after her, please." The grizzled Man-at-Arms looked at the wizard and, comprehending the order, nodded. Quail immediately attempted to cast Awareness, but suddenly seeing distant figures appear across the way distracted her, and she stumbled on the final words of the spell. (Casting attempt fails). It was the Necromancer Missy's troops. She had no love for Necromancy, and a particular dislike for Missy; who loved employing lots of crossbowmen and strange men armed with fire-spitting sticks that she had kidnapped from future times. The Sigilist's thoughts turned back to the matters at hand, and as she approached the statue of the two battling figures, she saw a part of the base had crumbled away, and inside was a chest; most likely the one Bailey had told her about. Further ahead of her was a low, ruined, building , and to her right a section of the city's crumbling viaduct. Quail was pretty sure she heard the maniacal chattering of the Soothsayer Gru's minions from that direction. Then, a green glow appeared in the sky, and the Maga Librarian looked up to see one of Bemis's Draining Word calling cards for Elemental Bolt light up the low clouds much further away in the ruins. Kinny ran forward to a statue near the watchtower, and as she peaked around it to check on the progress of Missy's group, a crossbow bolt smacked into the statue's pedestal right above her head showering her in stone fragments. "It pays to be short sometimes," she thought to herself as she tilted her head forward to dust the grit from her hair. She would later regret that move, for a second bolt hissed through the air, and caught her right on the temple. Luckily, at the angle it hit the halfling's head, it didn't penetrate her skull, but glanced off after cutting a deep divet in her scalp, knocking her out. She toppled into the snow like a little tree. Meanwhile, Quail, Sir C., and Luc Demic had run over to the low ruin to check it out. They could see a pile of rubble near the center on which lay an old sword and shield. The Sigilist could not perceive any magical qualities to it, but the Knight standing by her, could tell , even under the layer of dirt and grime, that it was made with such workmanship and skill that would be worth a small fortune once properly cleaned and restored. 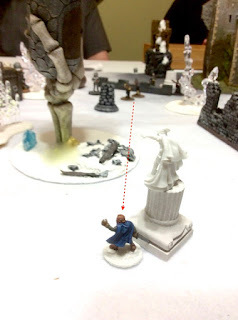 As he jogged forward in his armor to retrieve it, he immediately became aware of the Necromancer's Treasure Hunter entering the ruin from the other side. Sir Cardidil drew his sword, and prepared to fight for the prize. 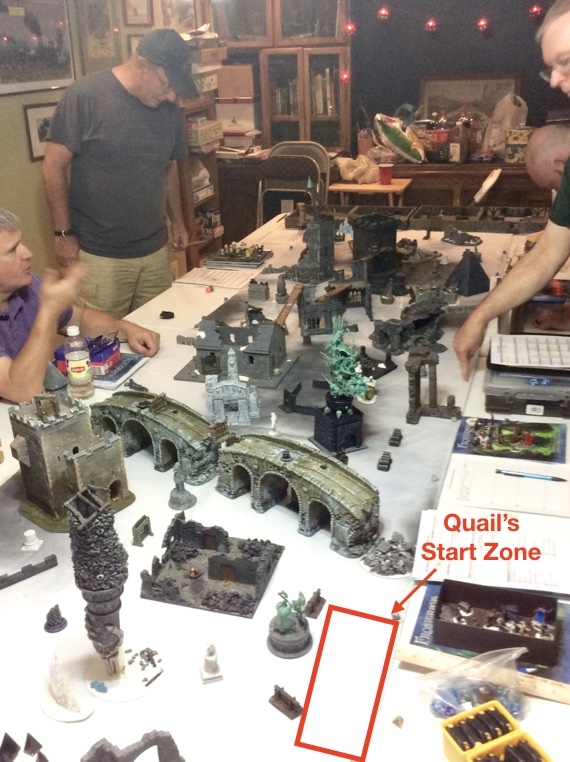 Quail and Luc Demic cover Sir Cardidil, as he runs forward to battle the enemy Treasure Hunter in the low ruin. The Reveal Secret treasure can be seen on the pedestal of the statue in the lower left of the photo. Quail's short lived fog wall is on the far side of the ruin, and Clol stands ready on the right, by the viaduct, in case any of Gru's minions should decide to wander over. Quail suddenly recalled the portents that she and Bailey had foreseen in the stars when they had used the Celestial Telescope the night before; and the wizard knew that what was happing now would be a critical moment in their excursion. She also knew she would have to ask fast, and she called over to Bailey, "Remember the stars!" (Quail uses Celestial Telescope benefit, and I draw two chips from our initiative bag, getting a 1 and 7. 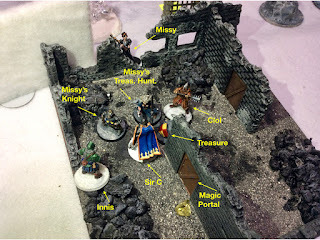 I takes the 1 for first initiative this turn) Quickly, the Sigilist recited the words of a Fog incantation, and a nice wall of billowy mist appeared on the far side of the ruin, just as a couple of Missy's Marksmen were moving up and preparing to fire in their direction. Quail then shouted over to Innis, as she knew they would need his help. Over on the other side of the engagement, Bailey heard Quail's reminder about the stars, and quickly recast Telekinesis again, before Missy's Apprentice could. Succeeding, the chest rose up and flew over a wall and dropped behind, just out of view of the opposing spell caster. Dorchesman ran over to get the chest, and Sally the Ranger went with him to offer support; in case any of the Necromancer's troops decided to pursue. Cirvid galloped directly towards the enemy Apprentice in a hope to distract him for a turn or two. The scene on the left of the field. Bailey has used Telekinesis to move the contested chest to within Dorchesman's easy reach. Back at the low ruin, more troops were heading towards the debris-filled building. Quail watched in dismay as her beautiful Fog wall suddenly started to loose cohesion, and melt into strands of mist. (Rolled a 19 for my start-of-turn Fog Roll.) Quickly, the Sigilist cast another; though she set this second one a bit further to her left, to help protect her Apprentice from the Necormancer's missile troops as well. By now, one of Missy's Knight's had entered the ruin as well, and the Necromancer herself approached too. Clol had joined Sir Cardidl, and the Necromancer quickly shot a Bone Dart at him, hitting him in the arm. The big Barbarian winced at the fierce stinging pain, but continued to the aid of Sir C. With his mighty Club of Battering the Barbarian joined the fray, and, despite his injury, the pair made quick work of the enemy Treasure Hunter. The battle in the low ruin grows. You can see the differing placement of Quail's new Fog wall. 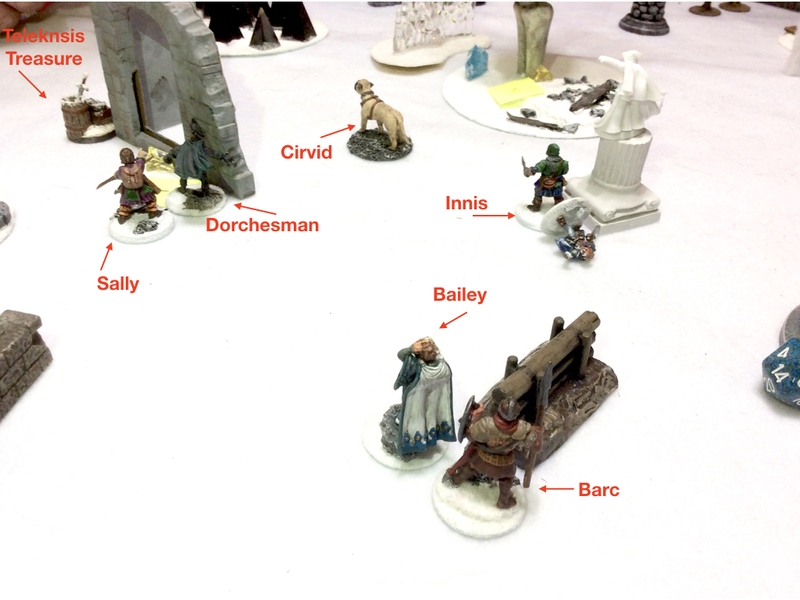 The enemy Knight and Missy suddenly found themselves facing Quail and four of her warband, all by themselves. Their decision to stay and fight it out, or leave, suddenly became easier for them; as suddenly calls of "Troll!" and "Help!" rang out from their fellow soldiers over on their right. For appearing through the ruins and mist lumbered a Zombie Troll and 4 Death Cultists. 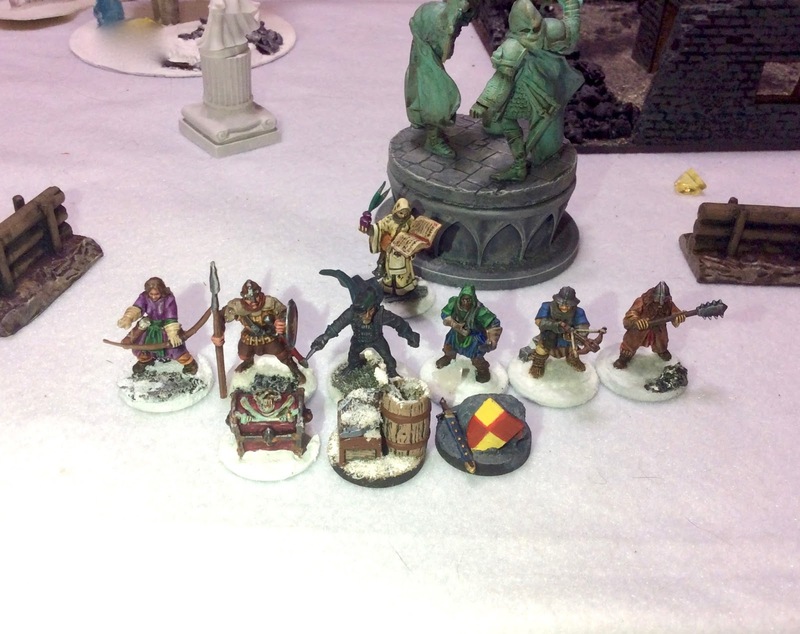 Quail's entire party, watched wide-eyed, as the cultists and their big beast laid right in to some of the Necromancer's troops, including her Apprentice, who had been caught right in the path of these interlopers. Quail took advantage of this sudden lull in the action to try once more to cast Awareness, but her attempt again fell very short, making her aware of nothing more but a sharp pain at the back of her head. (Failed by rolling a 4; took 1 point damage) She puzzled at what might be clouding her mind. Innis took the opportunity to grab the finely crafted sword and shield from the ruins, while Sir Cardidil and Clol worked at pulling the bone sliver from the Barbarian's arm, and bandaging the wound. 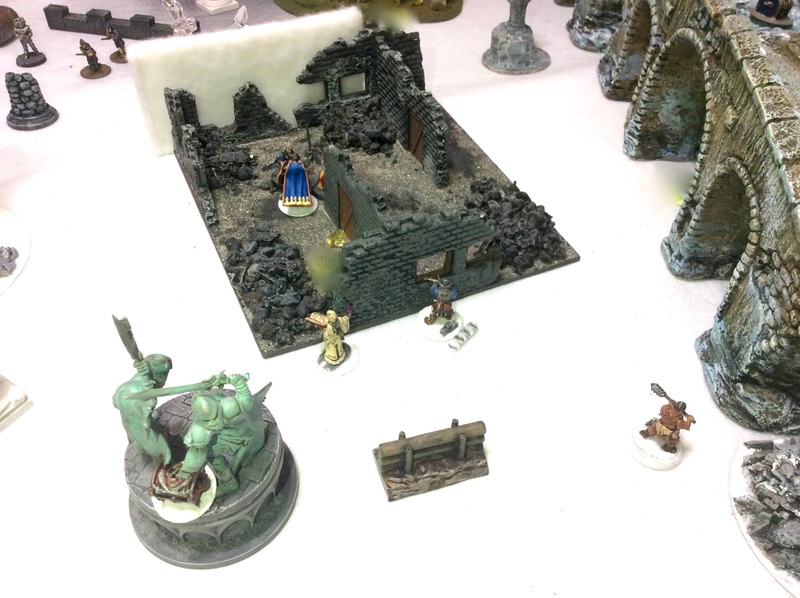 Missy's Apprentice and a Marksman are overtaken by the newly arrived Zombie Troll and Death Cultists. As the ache slowly left Bailisette's muscles, she was shocked to suddenly see one of Bemis' Dwarf Treasure Hunter's appear on the ruined upper wall of the tower. (He used a Teleport potion.) The sight of one of the other Sigilist's soldiers brought up a well of anger as she flashbacked to the moments of fear and pain in the library. Quail saw the sudden appearance of the Dwarf as well, and quickly looked over to her Apprentice to see if she had noticed. The wizard could see Bailey staring at the tower, and without looking, the young woman reached a hand under her robes to draw her sword. The Sigilist called to her Apprentice, "Bailey, don't! ", but got no answer, or even acknowledgement. The Maga Librarian realized she couldn't reach the girl in time to stop her, and quickly decided on trying to at least try and help her. So Quail splayed the fingers of her right hand towards the Dwarf, and recited the words of Blinding Light. A bright glow appeared around the face of he enemy Treasure Hunter, and he flailed his arms at the sudden inability to see, then stumbled back off the wall and dropped out of sight. Quail looked over and could see Bailey already saying the words of a Teleport spell. And before the Sigilist could reprimand her Apprentice again, the young woman disappeared in a flash and re-materialized on the top floor of the tower. A vengeful Bailey battles Bemis' Treasure Hunter. in the lower floor of the watchtower. Quailelyn suddenly became aware of eyes watching her, and looked around to see several nearby members of her group all looking at her. She wanted desperately to go after Bailey, but she knew she couldn't just leave everyone and go chasing after her Apprentice when they all were depending on her and her leadership. So the Sigilist said a little prayer, and then began giving orders. She instructed Barc to get the treasure from the warrior statue, and Sally to keep an eye on the tower and make sure none of the Necromancer's troops got any ideas. The Sigilist then realized she had never had a chance to investigate the magical portals, so to Luc and Sir Cardidl, she said, "Come with me. We're going to explore these magic doors that I've heard about." 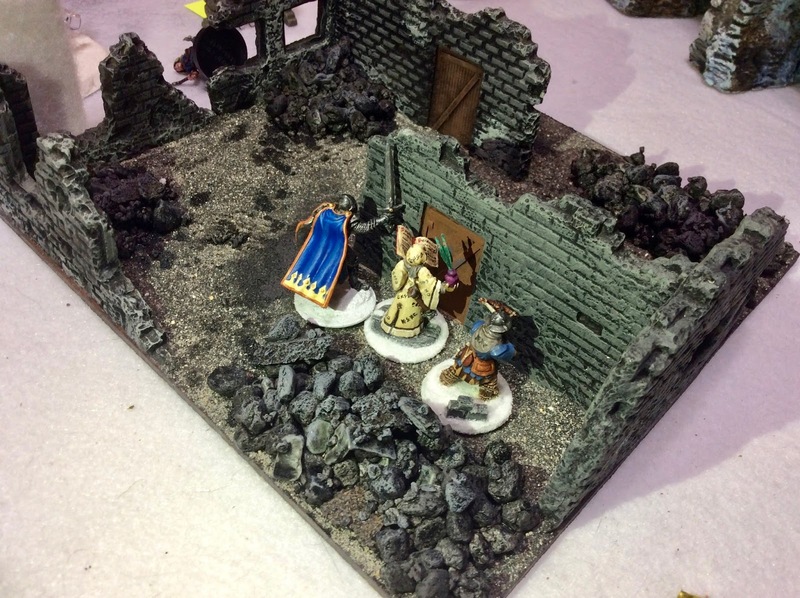 They moved to stand in front of the portal in the low ruin, the two soldiers flanking the wizard. Quail gave one last look over her shoulder towards the tower, then pulled the small vial of Invisibility potion that Bailey had brewed that morning, and drank it down. She swung open the door of the portal and stepped through. The wizard felt a tingling sensation all over her body, and the world around her spun into a swirl of colors. In a second the colors swirled again and began to reform into new surroundings. Looking around herself in disbelief, the Sigilist was dismayed beyond words. There she stood in the great hall of her own tower. The two small kettles Bailey had used to make the potions earlier that day, sat in the center of the table, and the glowing embers of the fire crackling softly in the hearth was the only sound. Quail took a deep sigh, as she was overcome with emotion. Pulling a chair from the table, she sat wearily down; and putting her head in her hands, she cried. As everyone returned to the tower that evening, singly or in pairs, Quail slowly got the story of the rest of the day's events. Sir Cardidil had been transported to some far corner of the district, where he had almost immediately come face to face with another of the Zombie Trolls. The Knight had been somewhat disoriented by his trip through the portal, and before he could swing his sword, the beast had clubbed him over the head knocking him out cold. Luc had found himself in one of the treasure rooms, where he had materialized right near Missy, who herself was fighting another unknown soldier. There was another wizard there dragging one of the chest across the room as well, and Luc decided it might just be best to leave unnoticed. Eventually, it came down to just Bailey who had not returned, and everyone could feel the tension in the room build as the minutes passed. Then at last, the young woman came through the door, bruised and with a deep cut on her arm. She avoided everyone's gaze, and sheepishly made her way to her room without a word. 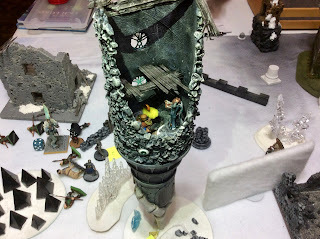 It was only later that Quail learned that after a short fight with the Dwarf, the experienced fighter had bested the Apprentice in just a few swings and left her wounded and unconscious in a corner of the tower floor. The group was only able to recover three treasures. The one Dorchesman brought back contained a Grimoire of Furious Quill , which Quail already knew; so that could be sold. Also in the chest was 80 gold coins (Treasure table result 16). The finely crafted sword and shield that Innis retrieved were like finding money, and it was Sir C's opinion that they could easily sell for 400 gold coins. (Treasure table result 3: D20 x 25GC, and I rolled 16); and the cache of scrolls that Barc brought back contained only two that hadn't been ruined by the elements: Illusionary Soldier and Push. There was also 50 gold coins (Treasure table result 7). Quail suddenly found herself a very wealthy wizard. She would need to buy a 10GC healing salve for Cirvid who had been badly wounded; but luckily no one else had been seriously injured. The Sigilist said a little prayer of thanks that her Apprentice had come back alive. She was not pleased at all at her rash behavior, and was not sure how to help the inner demons that seemed to have overcome Bailey. She could however help her protect herself; and thought it might not be a bad idea to get her a magic sword to help make up for the skills she lacked as a fighter. In fact, Quail reasoned, it might not be a bad idea for herself to get one as well; as she was no skilled swordswoman either, and the city seemed to be getting more and more dangerous every day. In the final analysis, we all agreed that the treasure rooms were a hopeless cause. 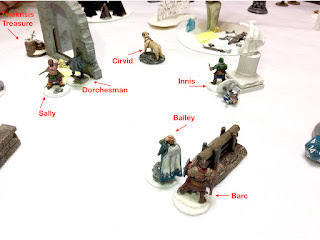 No one got any of the treasures out of the rooms (required of the scenario to actually claim the treasure), and we all agreed that within the scope of the game there just wasn't time to defeat the 2 Frost Wraiths and all other visitors to the room to actually get one out. I wonder if this result is much different in 2 player games, or was it brought on by us having four treasure rooms and 8 players? Or is it just a universal problem in this scenario.